Bridge owners and designers are often surprised to learn that precast prestressed concrete bridges are usually lower in first cost than other types of bridges. Coupled with savings in maintenance, precast bridges offer maximum economy. The overall economy of a structure is measured in terms of life-cycle costs. These include the initial cost of the structure plus the total expected maintenance costs. The lifetime cost of repainting steel bridges can amount to 10 to 20% of the original cost of the original cost of the bridge. 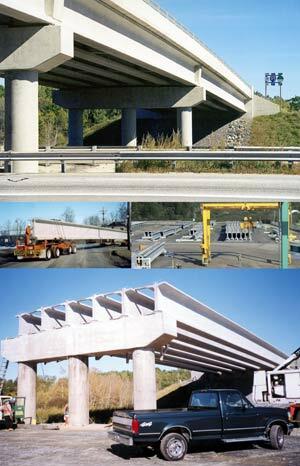 Precast prestressed concrete bridges built in accordance with provincial government requirements should require very little if any maintenance. They are constructed using high quality materials to exacting manufacturing tolerances. Fatigue problems are minimal because traffic loads induce only minor stresses. Precast prestressed bridge girders require minimal lead times because they are locally manufactured in standard shapes and sizes. The precast components are easy to erect in any weather. Simple connections join the deck girders to the substructure.